“I made a couple of calls and believe the sign will be safe,” she said. And so, for the moment, would be one other vestige of the Jewish Lower East Side. In reading In Chinatown, Remembering the Origins of a 126 -Year-Old Synagogue I did what I always do and go down a rabbit hole of research. The Eldridge Street temple, the first synagogue built by Eastern European Jews on the Lower East Side, the was completed in 1887 to the designs of the Herter Brothers, architects. It is the home of Congregation Khal Adath Jeshurun with Anshe Lubtz, another congregation that joined after the building opened. 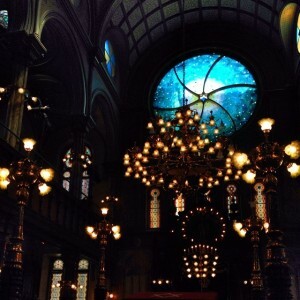 The Museum at Eldridge Street aka the Eldridge St. Synagogue is one of the prettiest buildings on the Lower East Side and one of the most amazing interiors in the city. It’s sad to think of how far it fell during the time that the Orthodox population of the Lower East Side dwindled. Sad, but not surprising, due to the general state of the Lower East Side in the 70s and 80s. After the 90-minute gathering yesterday, after the applause and amens, the sanctuary was empty again. For now, it will remain silent. And waiting. They did that, and even more. Never mind the 126 year old Congregation, the Friends of the Eldridge Street Project is older than I am. By the time I started to work with the Museum in 2007, it was called the Eldridge Street Project and was in the middle of the grand reopening. The amazing Egg Rolls & Egg Creams Festival was seven years old and the museum/synagogue was well on the way to being the marquee tourist destination that it is.Kiki Smith’s wonderful window was installed three years later and it seemed as if the restoration was complete in time for the 125th anniversary. I feel that I’m lucky to work so closely with the museum. I know more about it then the average NYC resident. Maybe even more than the average Culture Vulture, but there’s so much about which I wasn’t aware. The article about the grand reopening is an amazing overview of the building and congregation’s history. We as a city are lucky to still have it as a part of our present. By the mid-1950s, without funds or a substantial congregation, the main sanctuary was sealed shut; only a remnant of the original congregation continued to use the smaller ground-floor study hall. 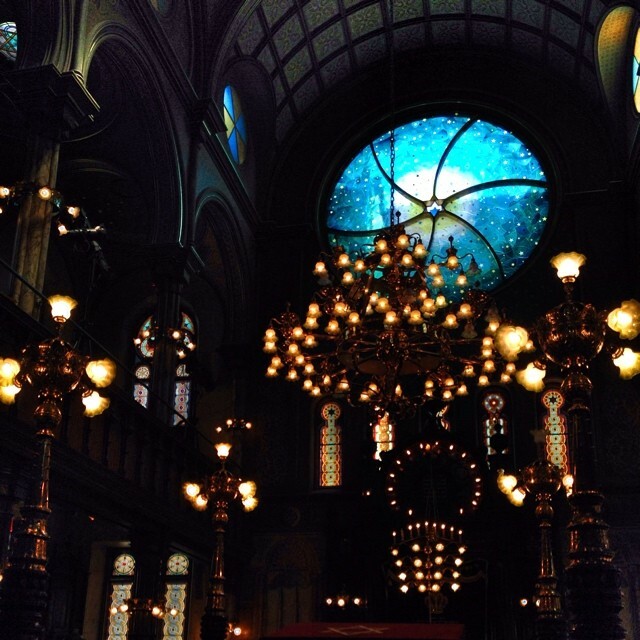 Then, in 1971, the water-damaged main sanctuary was surveyed with astonishment by Gerald R. Wolfe, a New York University professor, who founded the Friends of the Eldridge Street Synagogue. Fifteen years later, the preservationist and journalist Roberta Brandes Gratz was so taken by its latent promise that she started the Eldridge Street Project, helped obtain its landmark status and began a fund-raising drive that gradually brought the sanctuary back to life. A clay pipe or a pottery shard is a fine day’s work for an urban archaeologist. Celia J. Bergoffen found a bathhouse. I’m fascinated by the Lower East Side’s history. That’s obvious each time I do one of the Conservancy’s tours (and return for more like I did this past Sunday). I contemplate moving there if I win the lotto, but sometimes I wonder if I like its present as much as its past.